Very Limited to 1000 Copies! 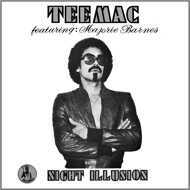 Soul Jazz Records’ are releasing Tee Mac’s ‘Night Illusion’, a lost classic Nigerian Afro soul meets disco boogie funk album originally released in Nigeria in 1980 as a private-press release of 1000 copies on the enigmatic artists’ own label. now a cultural icon of Nigerian music throughout the world, the recent crossover success of William Onyeabor shows just how much undiscovered Nigerian music remains waiting to be explored outside of the country. formed the heavyweight afro rock group Tee Mac and Afro Collection (which included Johnny Haastrup on keyboards and The Lijadu Sisters on vocals). This band was famously joined by the legendary Cream drummer Ginger Baker who came to Nigeria to play with them in 1971 (captured in the film Ginger Baker in Africa). Records to release his self-financed album Night Illusion, as well as buying two nightclubs and also investing in a number of mineral mining companies!